High quality, lightweight torch kit suitable for soldering, heating and shrinking, suitable for daily professional use. 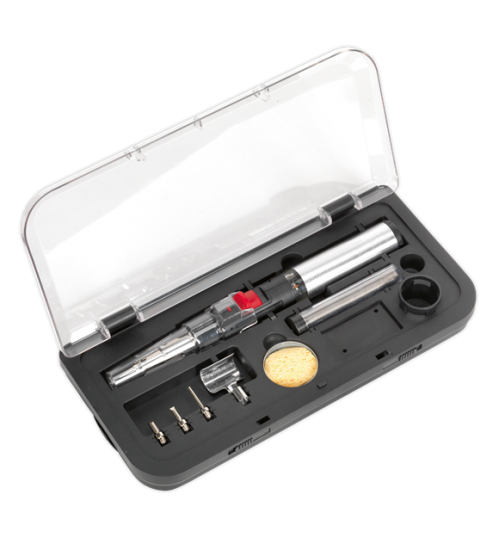 Kit includes Soldering Torch, Hot Air Nozzle, Deflector Nozzle, Soldering Head, Soldering Tips (x3), Hot Knife Tip, Soldering Sponge, Solder Wire. Powered by butane (lighter fuel) and features a piezoelectric ignition switch. Supplied with an anti-ignition cap and features an adjustable gas/flame control. Torch is fitted with a retractable stand.